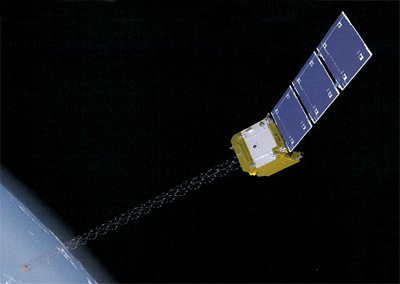 Orbcomm Inc., a global satellite data communications company providing two-way Machine-to-Machine (M2M) communications, announced in May 2008 that it has signed a next generation satellite constellation contract with Sierra Nevada Corporation (SNC) to build 18 new Orbcomm Generation 2 (OG2) satellites with an option to purchase up to 30 additional OG2 satellites to augment and upgrade Orbcomm's existing satellite constellation. As Prime Contractor, SNC has formed an experienced integrated space team with unique and established space heritage, resources and performance records, including Boeing Intelligence and Security Systems (I&SS), ITT Space Systems and MicroSat Systems. The integrated space team also includes several other key subcontractors and industry leaders with unparalleled experience in both the design and construction of complex communications systems and satellites. SNC, Boeing and ITT will provide oversight, systems engineering, technical management, integration and mission assurance functions to assure the successful performance of the OG2 program. MicroSat Systems (MSI), a wholly owned subsidiary of SNC, will leverage its experience on the TacSat-2 mission to design the spacecraft and perform integration and test activities for the OG2 satellites. In June 2008 SNC selected Argon ST to develop and deliver the satellite payloads for the ORBCOMM Generation 2 (OG2) satellite constellation. Each OG2 satellite will be equipped with an enhanced communications payload designed to increase subscriber capacity by up to 12 times over the current Orbcomm satellites. Orbcomm customers will be able to transmit data over the OG2 satellites at greater speeds and send larger data packets using future modems. The OG2 satellites will be backward compatible so that existing subscriber communicators will function seamlessly with the OG2 satellites. In addition, all OG2 satellites will be designed with Automatic Identification System (AIS) payloads to receive and report transmissions from AIS-equipped maritime vessels. Orbcomm intends to market this AIS data to U.S. and international coast guards and government agencies, as well as companies engaged in security or logistics businesses for tracking shipping activities or for other navigational purposes. The total contract value for the 18 spacecraft is $117 million. Payments under the contract will begin upon its execution and will extend into the second quarter of 20112, subject to SNC's successful completion of each performance milestone. Orbcomm selected the Falcon-1e launch vehicle in 2009 and plans to launch the 18 OG2 satellites in separate missions of multiple satellites each between 2010 and 2014, consistent with the FCC authorization recently announced by Orbcomm. SNC's unique mechanical configuration allows for multiple satellites to be efficiently packaged into several types of launch vehicles, providing Orbcomm with flexibility in selecting a launch provider. In late 2010 Orbcomm decided to launch the first two satellites as piggy-back payloads on a Falcon-9 launch and the remaining on two more Falcon-9 launchers in 2012 with the first containing at least eight satellites. In December 2011, the schedule was again revised: one satellite will fly piggy back on the Dragon CRS-1 mission in 2012. Then a dedicated launch of 6 satellites will follow in 2013 with the remaining 11 satellites following in 2014. The first launch with one prototype satellite ended in a lower than planned orbit, as the second stage of the launch vehicle was not able to ignite for an orbit raising burn after the prime payload was deployed. The satellite reentered after only two days in orbit with only some engineering tests performed. The second launch in July 2014 with six satellites was successful. But in June 2015, the Company lost communication with one of the satellites (Orbcomm FM111, L1). The third launch with eleven satellites was successfully conducted in December 2015. By August 2017, due to failures only 12 of the satellites were operational.